Mods: Can we put the various real and alleged royal wedding stuff in one thread? Looks like there could be at least 3 royal weddings next year. How excitement! OK, let's get stuck in. I know royal memorabilia can be craptastic but surely the Royal Mint can do better than this? The design for an official commemorative coin marking Prince William and Kate Middleton's engagement has been unveiled - but royal fans may have trouble recognising the couple. The prince and his bride-to-be are featured on one side of the £5 collector's pieces being produced by the Royal Mint. An image that bears some likeness to William is shown in profile but Miss Middleton is face on and appears older and to have gained weight. The coin was designed by the Royal Mint's in-house engraving team and has the Queen in profile on the other side. The piece is the first royal engagement coin produced by the Royal Mint and was approved by the Queen and William. 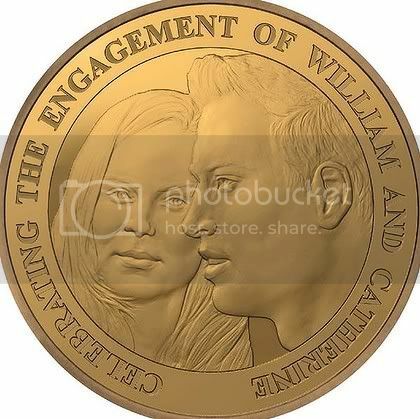 A Royal Mint spokesman said: "The inspiration for the design came from photographs of the couple at a sporting event - the play on the traditional portrait is that Prince William is seen in profile, alluding to his royal status." When asked about Miss Middleton's likeness a spokesman stressed that the design "does go though a rigorous approval process". Many commemorative medals and coins have been created by the Royal Mint in honour of the monarchy during its 1100-year history. When William's father, the Prince of Wales, married Lady Diana Spencer in July 1981 the event was marked by a coin showing the couple in profile with the Queen's image on the other side. Dave Knight, the Royal Mint's director of commemorative coins, said: "The Royal Mint has been recording historical events for over 1,100 years and we're fortunate to be in a role that allows us to add to that legacy. "The 5 Alderney coin we have designed is a wonderful way to celebrate and remember the start of Prince William and Catherine Middleton's life together." The couple will marry in April at Westminster Abbey. The coin can be ordered on the Royal Mint's website and is available in a number of metals from cupro-nickel, costing £9.99 ($15.40), to 22-carat gold priced at £1550 ($2400). It looks slightly like William but the face on the coin does not even resemble Kate. Oooh thank you A*O for starting this thread! I, too, am super excited about all the Royal weddings about to commence! I have already told my boss I want April 29th off (that's still the date, yes?) so I can do absolutely nothing but watch it and the repeats all day! Also, that coin is dreadful and it looks like a rush-job. I hope they come up with another one not quite so infomercial-ish. It's really not good. Looks like Napoleon Dynamite drew it. He looks better on the coin than in real life and she looks far worse on the coin. I'm wondering how this awful design slipped past, maybe on purpose? If it is recalled the ones already sold will become even more of a collector's item. I can't believe these coins are not a joke. I really, really want one. They are horrific in every way. The coin is awful. Kate looks like Janis Joplin. Does anyone else think the other royals are quietly getting married next year so that William and Kate have to deal with all the frenzy? I saw where the bone china collection is out, too--with their initials entwined. I really would love to get the pill box.